So, no need to get disheartened if you are not making it to the Vegas as we showcase you 5 Free Android Casino Games which would surely fill your life with excitement, fun and pleasure. Android Casino Games provide a pleasurable UI, exciting games, rich graphics, top-quality sound effect and above all a virtual Vegas like experience. You would simply love to play and enjoy Android Casino Games not once but many times. The 5 Free Android Casino Games featured here under are among the most popular Android Casino Games Apps currently. What’s more they come for absolutely free and have been already downloaded by million of Android users across the globe. All the Android Casino Games shown here can be easily downloaded from Google Play. So just go through the 5 Free Android Casino Games and we are sure you would love to download them and play these amazing, exciting and fantastic Android Casino Games. MobilityWare now brings Solitaire card game for Android devices after its massive success on iPhone. Solitaire has been custom made for Android devices and comes as a free download. It comes with the options of playing Solitaire Draw 1 Card and Solitaire Draw 3 Cards. It supports Portrait and Landscape and also provides Vegas Scoring and Statistics and many other exciting features that make Solitaire one of the most amazing gaming App on Android. DH Texas Poker has been loaded with exciting features that makes it an absolutely pleasurable gaming app on Android devices. What’s more DH Texas Poker is available for 100% free. Some of its amazing features include different game mode such as play now, private room, select casino, inclusion of VIP Table as well as Private Table, online rewards, daily login lottery and much more. With Slotmania Android Gaming App you get to have a true Vegas experience right on to your Android device. Slotomania is one of the most popular video slot game that you would get to play and that too absolutely free. It brings together top-quality graphics and sound effects to provide you with simple yet exciting games to play. The overall experience it just awesome. Slotomania is also widely popular on Facebook. Roulette Royale is a free Android Gaming App which provides you with a virtual Casino experience. From MyWavia Studios, Roulette Royale has one of the best virtual betting area and an amazing gaming zone as well. It has been empowered with rich UI to provide you with a memorable and pleasurable gaming experience. Slot Machine is a free Android Gaming App with Vegas Casino Style Slots. It comes with multi pay lines, surprising mini games, varied themes, virtual shop, jackpot and more. It includes mini games such as Video Poker, Super Spinner, Super Derby, Scratch Card and Lucky’s Pot of Gold. 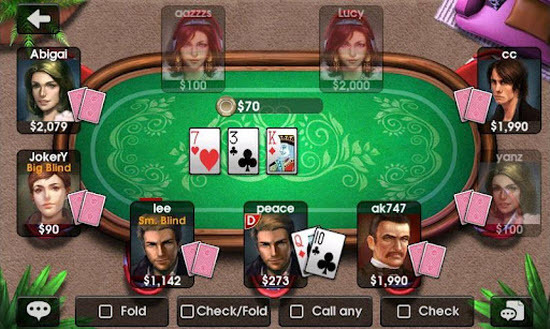 Playing Texas Poker keeps boredom away, that’s why I made sure I have this game installed in my smartphone.